White asparagus has always been considered a refinement and also requires a lot of attention during cultivation. The result, however, repays the effort or, if you buy them, the expense! Those White Bassano del Grappa, I am a DOP product much sought after and a particularly delicate taste. 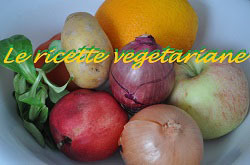 This is my interpretation of a typical Venetian presentation for this vegetable. It is a preparation pretty simple but it requires a few steps, from cleaning and cooking asparagus to the sauce preparation. And it is certainly not a light dish, if only for the amount of oil used! Although the traditional cooking is done in the pot holding the vertical asparagus with tips out of the water, I prefer to cook them steamed for years; the result is very good. With that amount, you can get four strong starters or a main dish for two people. First cook hard-boiled eggs an abundant minute less than the usual time. The yolk will be more suitable for the preparation of the seasoning. Peel the asparagus thoroughly (if you want then keep the zest aside: can be used to further spice up a cream of asparagus!). Halve the boiled eggs and mash the yolks in a bowl with two CT lemon juice. Continuing to mix with the whip gradually add the olive oil, as in the preparation of a mayonnaise. Add salt and pepper according to your taste and keep stirring and adding oil until you get a smooth and homogeneous cream. Arrange the asparagus in a steaming basket by adding a little salt. Place the basket on a saucepan with water already boiling and cover: cooking requires from 15 'to 20' depending on the asparagus. Meanwhile chop a CT capers to add to the sauce, stirring gently. Do coarsely chopped egg whites and add half the egg sauce, stirring gently. Reserving the rest of the egg whites to decorate the dishes. As soon as the asparagus are cooked, arrange on plates and cover with the sauce of decorating eggs then with remaining egg whites. Immediately put on the table: these asparagus, hot, are a marvel. 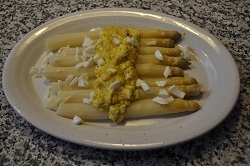 For this preparation you can also use other white asparagus, essential is always the freshness. This dish can also be served as an appetizer for different people with cold asparagus and cut into pieces and covered with sauce. A variant consists in presenting the asparagus alone, accompanying each dish with a bowl of sauce in which to dip gradually you eat them.